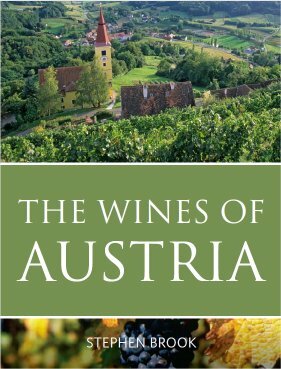 This is The Wines of Austria by Stephen Brook, a new book published by Infinite Ideas earlier this year. The RRP is £30.00, but I have a review copy. It’s a paperback of 294 pages, with black and white maps in the text, and several colour plates gathered together in the centre of the book. Like other books in this series, the general design and physical impression is good. As often the case with wine books, I found the maps disappointing, but I know good cartography is expensive and they are better than nothing. My only other criticism at that sort of level is the lack of a complete index – there is an index, but for wineries only. There is also a glossary, but that did not have an entry for the wine style I needed reminding about while reading. This is a book that contains a lot of detail, and relatively short introductory chapters and sections, which made it heavy-going for me as a reader with no claim to any specialist knowledge of Austrian wines. It does not however lack clarity – indeed Brook writes very well. It is just that for someone who does not already have sufficient knowledge to hang the many facts on, the sheer number of different regions, sub-regions and producers is difficult to take in. Someone with more prior knowledge would doubtless get more out of the detail, but I decided that for my purposes it is a work of reference rather than a book to actually sit down and read over a few days. I must admit though that I struggle to image how the book could be improved on from my perspective. At the risk of causing offense to Austria and lovers of her wines, I’d venture that part of the problem is that the history of Austrian wine as an international product is relatively brief, so there is not so much that can be written about historical context – compared with Port, Sherry, and Madeira to mention of vinous topics of other books in this series. The other sort of context useful for the organisation of knowledge is geography. Seeing precisely where villages, vineyards and producers are, down to the level of vineyard slope orientation, greatly helps, and I suppose that comes back to my point about the inadequacy of the maps. So, an excellent reference book, and probably an excellent read if you already have a special interest in Austrian wines. For the more general wine lover there is still much to be gained from the book – I certainly learned quite a bit – but I suspect that much of it will remain unread on the first pass through. This entry was posted in General and tagged austria, book. Bookmark the permalink. Steve, as someone who professes a love of Austrian wines, and so may have a tiny bit more prior knowledge, I basically agree with your review. The maps are poor, which is a shame. One criticism mentioned in another review (in WFW) is that the book is a little conservative. I agree, though maybe for different reasons than the reviewer there. I think the book fails to cover some of the newer producers, especially those who have a strong commitment to biodiversity, biodynamics and natural wine. Austria is at the forefront of this revolution, so to miss it is to do Austrian wine today a disservice. Brook is particularly dismissive of one or two producers, not for their wines per se, but for their philosophies, or their marketing (he is annoyed by Gut Oggau’s idea that each wine is a family member represented via being named after a “family” member, and he doesn’t quite get to why they do this…another story). The book may indeed seem a little old fashioned in its layout at times, and in the author’s perspective, but I was pleased to read it. It was good on the factual info, but lacking a little in conveying the excitement found in this small wine country right now. I read the hardback. My own review might come across as a little more positive than my comments here. It is certainly good at least to see a book on Austrian wine. As ever, thank you for your comments, David. It is good to hear views from someone more familiar with Austrian wine than I – all I could really say was from the perspective of a wine lover interested in learning. I also reviewed this book, from the perspective of having lived in Burgenland (perhaps Austria’s premier red wine region) for a year, and visiting 3-4 times a year over the last 3 years (my partner is from Steiermark/Styria). My opinion was a lot less favourable than yours. There’s plenty of interesting history and culture that Brook could have focused on, but instead he went for a format with interminable producer profiles which as you hint, does not draw the reader in at all. In this regard I side with David Crossley, although I think even he is being kind. Cheers, Simon. I can relate to a most of your review. The only thing I think I would actually take issue with is your comments on the price and book production quality. Infinite Ideas are IMO making a much better fist of that aspect of the Classic Wine Library than Mitchell Beazley ever did. And specialist wine books are obviously not a big money spinner. It’s not like we are exactly spoiled for choice for books on Austrian wine, for example. Steve, consider if you will that Isabelle Legeron’s book “Natural Wine”, a beautiful illustrated 202pp hardback has a price of only £15. I could find other examples too. My guess is that the Infinite ideas books have a tiny print run, which has pushed the price much higher. Different books, Simon, and the street-price difference in the books is a lot smaller than RRP difference, even in percentage terms. I personally like the general look and feel of the new Classic Wine Library, and can generally live without pretty pictures unless they are needed to clarify the text. What I feel is most lacking in the series is good quality cartography.